Eighty students from Roosevelt Elementary School recently received $110 each in gift cards to Target on Bellflower Boulevard in Long Beach, where the children paired with police officers who assisted them with some shopping. 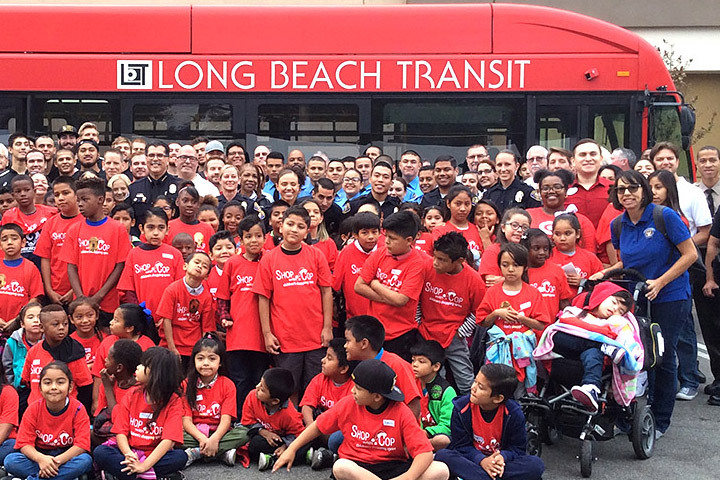 Long Beach Transit helped with transportation for the Shop with a Cop program held in collaboration with Target, the Long Beach Police Department, Long Beach Police Foundation, Long Beach Education Foundation, Long Beach Junior Chamber and the California State University, Long Beach men’s volleyball team. Students also were treated to food and games. SHOPPING TRIP – Roosevelt Elementary School students joined police officers and community volunteers for the Shop with a Cop event at Target on Bellflower Boulevard. Long Beach Transit gave students a lift to the store.